The following is something I’d realistically be better off not sharing with the world but I am compelled to publish online anyway. Shakespare’s Macbeth finds an archrival in the form of Macduff, and it’s likely no coincidence that the two have very similar names. They’re actually similar people, in some ways, but with significant differences. In modern texts — and perhaps in older ones as well, depending on how the transcriber decided he wanted to spell — this relationship is underscored by the fact the lowercase “b” in Macbeth’s name looks exactly like a flipped-around lowercase “d,” as you see in Macduff’s name. 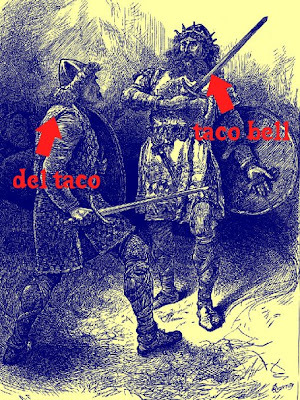 That all being said, can the same opposite-rival-“b”-and-“d” relationship be applied Taco Bell and Del Taco?